01:Gather and cleanse the seven stones you will use. You could use running water, sage, salt, sound, violet flame, or any crystal cleansing method you like. 02:Create a comfortable and clear space for the treatment. 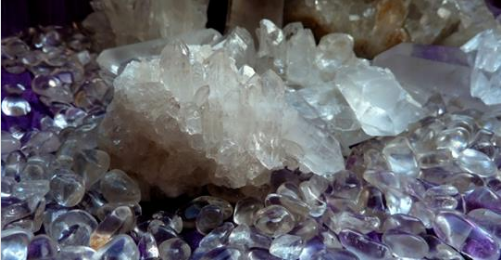 Crystal healing works best if you or your client can feel safe and relaxed.This treatment is done lying down, so it will work great on a bed, a massage table, a couch, or even on a blanket placed on the floor. You might want to diffuse some relaxing essential oils, dim the lights, and play soft, meditative music. I also like to smudge the room with sage to clear the energy. 03:Call in help from your soul and spirit team, and set positive healing intentions. I always get better healing results when I remember to formally invite in my own soul and healing guides to assist. I ask them to help me in creating the highest healing outcome. 04:Place each stone on its corresponding chakra. I like to start at the crown and work my way down. Place the Clear Quartz or Apophyllite at the crown chakra (right behind the head and touching the crown chakra). Place the Amethyst or Super 7 at the third eye chakra (in the center of the forehead). Place the Aquamarine at the throat chakra (at the base of the neck). Place the Rose Quartz or Danburite at the heart chakra (at the center of the chest). Place the Citrine or Yellow Fluorite at the solar plexus chakra (a few inches above the belly button). Place the Carnelian at the sacral chakra (a few inches below the belly button). Finally, place the Smoky Quartz or Black Tourmaline at the root chakra (on the public bone area if you are working on yourself, or between the inner thighs or on the hip if working on somebody else—to be respectful of his or her personal space). Don’t worry too much about getting each crystal in the exact perfect location. As long as it is close, it will work beautifully. 05:Relax, breathe, and meditate. Optional: you can do Reiki, energy work, and visualization while the crystals are working. You could start at the root chakra and place your hands on or above the stone. Imagine pure white light flowing into the stone and chakra, and hold the intention that the perfect healing, clearing, and balancing energies are being infused into the area. Stick with this for a few minutes, or for as long as you feel guided to stay there. Then move to the sacral, followed by the solar plexus, heart, throat, third eye, and crown. Doing this is optional and might enhance the healing, but know that the treatment will still work wonderfully even if you skip this part. 06:Leave the stones in place for a minimum of fifteen minutes. It normally takes about eleven minutes for crystal energy to fully integrate into the chakras and bio-system, so fifteen minutes will ensure that they have had plenty of time to work. You are welcome to leave them in place for a longer amount of time, if that feels right. 07:Seal the aura, and then remove and cleanse the stones. When you feel complete, imagine a bubble of pure white light that surrounds and seals the entire auric field. Take the stones off of the chakras, and be sure to cleanse them when you are done. This article (How to Open, Clear, and Balance the Chakras with Crystals ) was republished with permission from adriennegoff.com. You can find the original post here.